We’re now less than nine months away from the formal start of the election campaign. Even though it’s still over 10 months until polling day, the campaign is set to officially begin at a much earlier point in the electoral calendar than recent decades. This is because of a change in the law concerning the minimum number of working days required for the campaign. Mike Smithson of the Political Betting website has noted the significance of this, in particular how the timing of Easter and other bank holidays means parliament will be dissolved on 30 March. 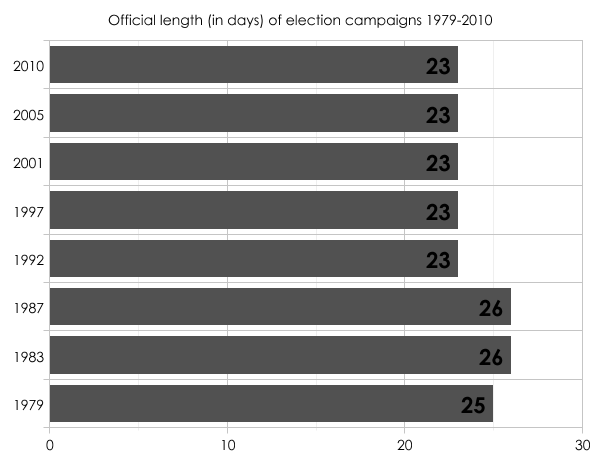 As a consequence, the 2015 general election campaign will last a whopping 37 days. I’ve had a look to see how this compares with previous elections. Legislation has always governed the length of this period, so it’s not that surprising to see so much consistency. Still, 23 days feels an awful lot shorter than the 37 we’ll be getting next year. 1997 was a real long haul. At the time it was speculated that John Major hoped such a mammoth campaign would make it more likely Labour would slip up. If anything the reverse proved to be true. I wonder what will happen next year. David Cameron can’t make great play of “revealing” the date with any sort of big announcement, though I imagine he’ll still want to address the nation in some form. What will be key is when precisely he chooses to make such a statement. Will it coincide with dissolution on Monday 30 March? 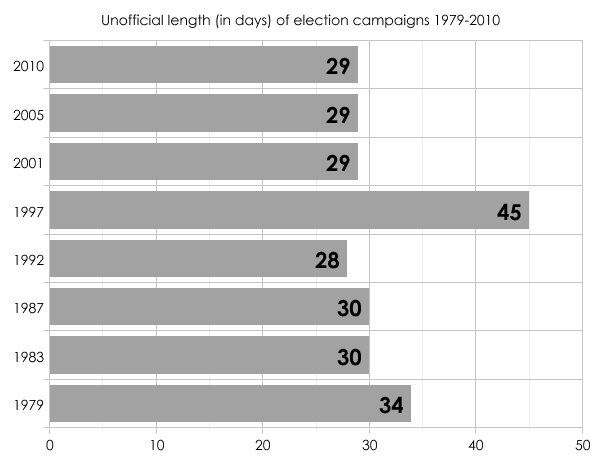 Or will it be the week before, thereby extending the 37-day “official” campaign still further? One thing to bear in mind: the Budget is likely to be on 18 March, and the Tories won’t want to have coverage of George Osborne’s speech overshadowed by too much election talk. Though by then I imagine they could well feel one and the same thing. They will need to pass a Finance Act between budget day and the dissolution, to impose income tax from 6 April 2015! Good point. In 1992 they ended up having to pass it in just three working days! The Budget was on Tuesday 10 March; John Major called the election on Wednesday 11 March; dissolution took place on Monday 16 March. Indeed – it means that the Budget becomes effectively an announcement of what the outgoing government will do if it is re-elected (which could be interesting, given the coalition) and the Finance Bill is pared back to the essentials. Compare 2010, when there were three Finance Acts: a short Act from the old government enacted in April just before the election, an “emergency” Act from the new government in July shortly after the election, and a third Act later on once the new government had had more chance to consider its policies in more detail.